Goodbye Cape Cod, Hello New Hampshire! We had a truly delightful “final supper” with my sister-in-law, Ini; and my niece, Lee up in Provincetown. They had worked all day taking down the “Appearances” art, sculpture, writing, and dance showcase, and everyone was nearly dead on their feet. Ini & Lee’s kind (and talented) hostess, Dot, opted out of accompanying us. 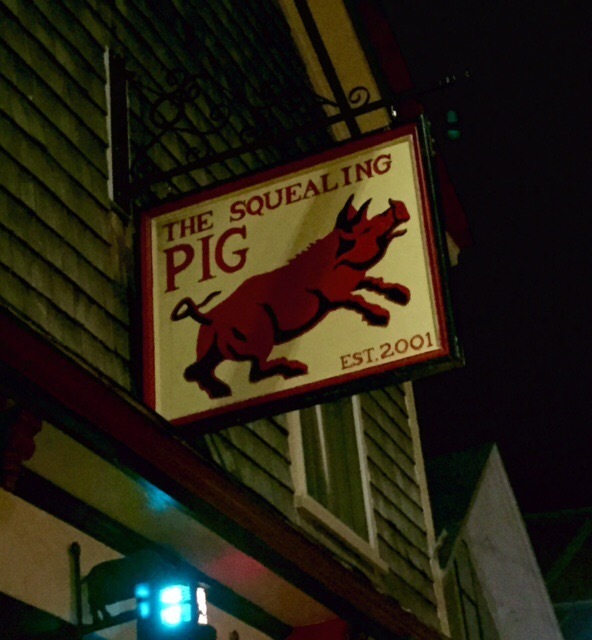 But she generously offered her place as a parking spot (saving us significant trouble and $) and we walked back into the downtown seeking a place called The Squealing Pig, which we thought might be a ribs and Bar-B-Que place. But it was better! I think the only thing made from a pig on the menu was a ham sandwich. 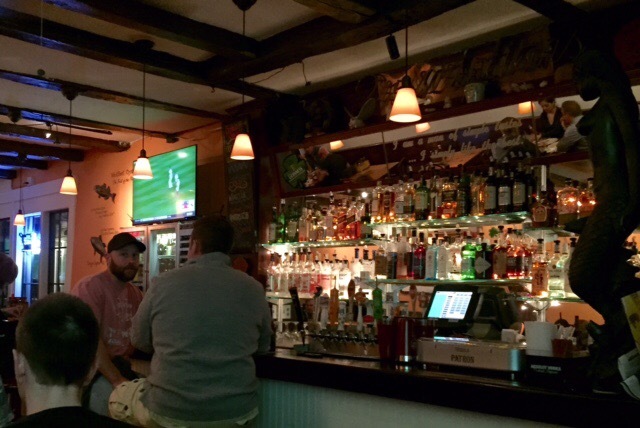 Both the food and the atmosphere was neighborhood pub style, and we had a wonderful time. Fish and Chips, Shepherd’s Pie, but also fried chicken, and spicy beef kabobs — and Tuscan fries doused in black truffle oil and parmesean cheese. OMH, what a delightful flavor. And great draft beers on tap. The only downside of the meal was sitting next to an enormous TV screen — Ini and I had our backs to it, but Lee and Jack had to face it, and the lighting effects were less than ideal. Even though the place was loud, it was not because of the TVs. Folks were simply having a great time with friends and with the staff, who were excellent hosts. I highly recommend the place, but don’t expect a pulled pork sandwich on the menu. Lee & Ini were bussing to their flight home the next day, and we hitched and headed to New Hampshire, but not before having our second visit to an excellent bakery and coffee spot right in Eastham near the campground. We’d only discovered it the morning before we had to leave, which is unfortunate because I could have spent a lot of time there. Excellent baked goods including doghnuts, muffins, and some of the best bagles I’ve had in quite a while. It is called the Hole in One, and it is attached to a full-fledged restaurant called the Fairway (note a theme here?). We knew it was a popular place our first morning in Eastham because there was a line out the door for service. All the locals pick up their breakfast and coffee there. The best thing about it was that, along with many flavors of bagle, they had flavored cream cheese to apply to them: jalapeno cream cheese, scallion cream cheese, and (wait for it) BACON and SPINACH cream cheese! I had an excellent plain bagle with that lovely bacon and spinach topping; Jack had an asiago cheese bagle with scallion topping and they were both excellent. We’re getting the hang of this hitching and road-readying routine, but still got away on a beautiful sunny morning later than we’d expected. 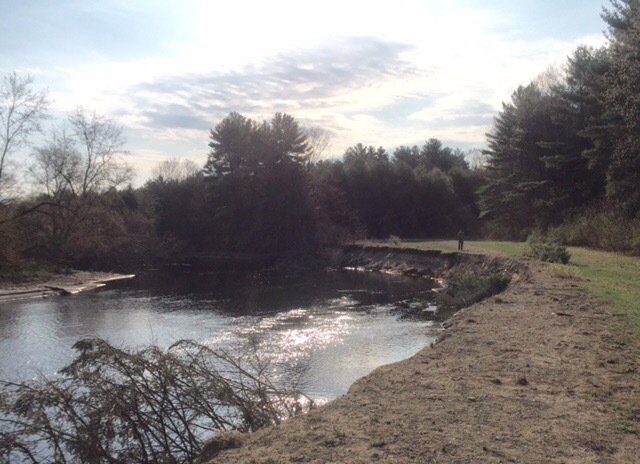 Uneventful trip to Swanzey, NH, to a campground on the Ashuelot River (pronounced, near as I can tell, Ash-WAY-Lot). The host is a great outdoors enthusiast, who is also a bicyclist. We didn’t get officially checked in until our first morning there (May 5 — today) because he’s always out and about, readying his place (which at this point is nearly empty) and getting everything ship-shape for the season. 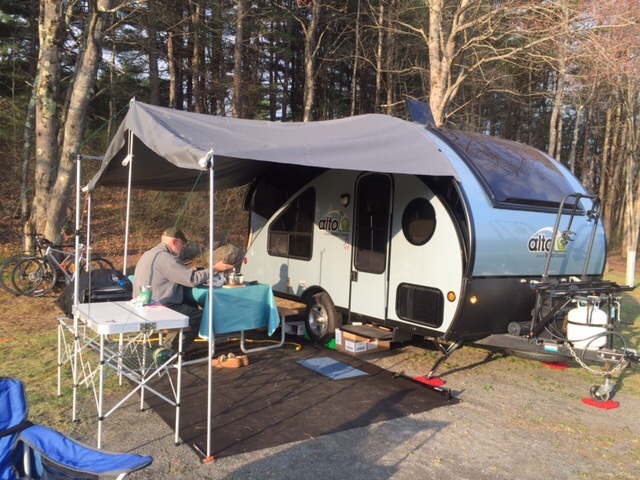 One of the reasons we chose this campground is its easy access to the Ashuelot Recreational Trail, another Rail Trail to add to our list. We will take our first wheel on it this AM. 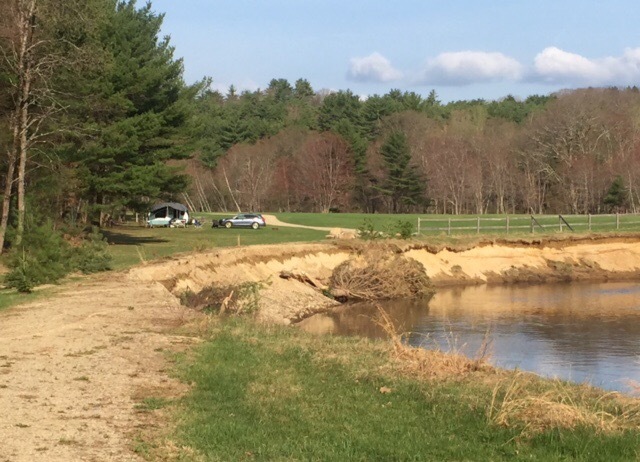 The Ashuelot River is chewing its way into the short trail-link from our campground to the Rail Trail. Last night we found a really big supermarket and did some shopping for groceries so we might not have to drive anywhere the entire time we’re here! We grilled some turkey tenders and added a salad and some pasta with pesto to the mix and sat outside (until the mosquitoes chased us inside) and it was a lovely evening. Keene is a little college town we’re looking forward to exploring via bike, as it is one of the points of interest on the Rail Trail. From there, we understand there are other connecting bike trails to explore. Lots of pictures to take.